Difficult to know whether it was NSW Labor’s hopelessness or Julia’s carbon tax that was more to blame. Probably both, in equal measure. BARRY O’Farrell has become the 42nd premier of NSW in the biggest landslide seen in modern Australian political history. Kristina Keneally stepped down as leader after conceding defeat to the Coalition in an electoral rout which ends 16 years of Labor government and may leave the ALP with just 20 seats, down from 50. With a 17 per cent swing and a surge in its primary vote even beyond its expectations, the Coalition is set to win about 70 lower house seats, Labor 20 and independents the remaining three. That sort of majority will carry the Coalition, which has governed in NSW for only seven of the past 35 years, through to the 2019 election at least. The Nationals had a highly successful night, and are expected to pick up five seats for a total of 18. Nationals beat sitting independents in three seats – Dubbo, Port Macquarie and Tamworth – and were likely to take Monaro from Labor’s Steve Whan and, in an extraordinary result, Bathurst, with a swing of 37 per cent. In a typically self-effacing victory speech, Mr O’Farrell stressed the achievements of his staff and parliamentary team, rather than his own efforts, and remained focused on practical issues of service delivery and infrastructure. “We are determined to end the rorts, to restore confidence in the government in this state once again,” he added. But his speech at the Parramatta Leagues Club would have sent a shudder through the Gillard government as he pledged he would “take the fight up to Canberra” on the proposed carbon tax. Early figures from the upper house also indicate Mr O’Farrell will have no problem passing his legislation. Time to start putting New South Wales back together again. I love it. Labor can be as arrogant as they like about thinking they will spoon feed their misguided reforms to the average Aussie. This is proof positive we are not up for that. The Federal Watermelons better realise that the NSW was jack of Labor because of its stupidity and morally corrupt behavior. 16 Years doing SFA. Now as they clowns in Canberra try the same tricks, I suggest it will seal thier fate. And what about the message Oakeshotts electorate passed to Peter Bessling, his minnie me. Wake up fools and listen to the electors. Love it !! Yes, we know that thanks…. I think the NSW election result should spell trouble for the Gillard/Green/Independent Coalition. What more evidence does Gillard and Federal Labor need, they are on a sinking ship by siding with the Greens and the not so Independents. The Governor General – whose son-in-law is the Assistant Treasurer and Minister for Financial Services and Superannuation, you mean? it…sniff…brings a tear to my eye. Yes. 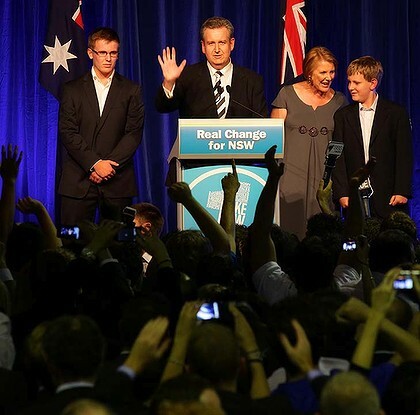 Congratulations to Mr O’Farrell on an extraordinary win, and to the people of NSW. The one thing the 2010 Federal Election definitely taught us, is to be very careful who and how you vote. 	Make the primary vote count, preferences can work in favour of the Labour & Greens. Labour Premier Anna Bligh did an outstanding job as a spokesperson in the Media during the 2010/2011 Floods. However behind every good spokesperson is a team of interdepartmental members performing the various roles for Disaster Management Coordination. This group will still function, irrespective of which government leads, as they have done for a very long time? ……………….. And this was all before the Floods. 	But ultimately, they support the Carbon Tax hence they are supporters of the Greens. The LNP Party of Queensland has my vote, and hopefully the Queensland Election will also send a clear message to Canberra……………………..The Gillard/Brown Government along with the Carbon Tax IS NOT IN AUSTRALIA’s BEST INTEREST. You forgot to credit the Qld Labor govt’s obsession with climate change as being a contributing factor to the Brisbane floods. In particluar the contribution of the Premier’s husband. Why do you think Wivenhoe Dam was kept full during a La Nina event? Actually the biggest losers in the NSW election are the Greens. Yes, everybody wanted to send a message to Labor because of it’s mismanagement and incompetence, but the Greens were supposed to be the new and aspiring party in Australian politics. Bob Brown would have been waiting in the wings to appear on TV to congratulate the Greens candidates for Balmain and Marrickville had they have won their seats, but where was he? The NSW public have sent a clear message to JuLIAR in Canberra … we don’t want any left wing looney watermelon ideas forced upon the Australian public, because of your deal to win government with the Greens. If there is one message from the NSW election result that Labor should take on-board is …. Australian’s don’t want a carbon dioxide tax! Indeed for the last year or two an electoral trouncing of NSW Labor was always on the cards. It wasn’t the carbon tax that booted them out. – Liberals outpolling Greens in primary votes in so-called ‘left’ electorates. These particular features of the election are the takeaway regarding the carbon tax. For there is no state reason to boot out independents like that, or to comprehensively walk away from Labor in rusted, welded and bolted on Labor seats. Would anyone have predicted a 30%+ swing in vote prior to this election? If nothing else there will be less of the aspiring Oake[snip]shotts and Winds[snip]ors around to sell us to the LaborGreens. Good on yea NSW!